Before London had any kind of corporate government, and long before the London Borough had been devised as a convenient administrative unit, local services (such as they were) had to be provided by the existing historic bodies. The parish already existed for spiritual purposes and had a form of 'management' in the form of its vestry and a mechanism for getting local people together, either in the church or in a nearby vestry hall. It was to the parish that local administrative responsibility was gradually given by Parliament. Even when new statutory bodies were set up to deal with lighting, policing, paving, sewerage and so on, the parish remained as the local unit capable of raising its local rate or tax. It was therefore important that people knew what parish they lived in and where the boundaries were. From this emerged the need for distinctive markers. Over time, the civil and ecclesiastical duties of parishes diverged, and so far as markers are concerned we are referring to boundaries of parishes in their civil manifestation (many were subdivided for ecclesiastical purposes). Boundaries by no means corresponded with other boundaries in the area, for example the City of London boundary crossed through the middle of several parishes. Knowledge of where boundaries were and what they were for was vital. 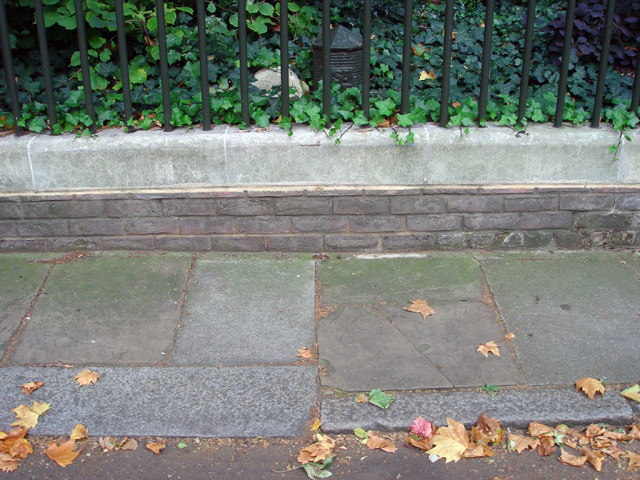 The inventory that follows is an attempt to record ALL London's surviving boundary markers. The inventory is divided into SEVEN sections. The first file is the narrative and brief history of London parish boundaries. The main photographic inventory for Inner London is split into three parts, arbitrarily divided into groups of 250. These are in register number order but one day they will be presented in a more useful form. The fifth file comprises odd boundary markers that are not parish boundary markers (under construction). The sixth and seventh files are the registers of parish boundary markers in the Outer London area, one file for north London and the next for south London, the latter very much being work in progress. To download the report and the parts of the photographic inventory, please click one of the buttons below. Please give the downloads sufficient time to arrive as they are large files. If you experience a problem using the button, there is an alternative link at the bottom of the column. All the links will open the item in a new window or tab. There are some links within these inventories. You may find it helpful to press the control key if you click on a link in the inventory; this will open a new window and on returning to the inventory will avoid you having to use 'back' button and downloading whole thing again. Please note the inventories are numbered in the order boundaries recorded. See note below about indexes which will allow you to search particular areas for marks, from which you will be able to identify the entries in the register. Outer London parishes are those located within today's Greater London (created in 1965) but outside the former (much smaller) County of London. The plan is to record all accessible surviving markers. So far, good progress has been made in outer north London, with south London to follow in due course. Markers along the boundary with inner London are dealt with in Parts 1-3 above. There is an index of all inspected marks, ordered by current London Borough (and by street name) or Parish (and street name). 1000 or so boundaries have produced about 1200 or so marks. The indexes include both Inner and Outer London areas. The index is not quite complete as there is a lag between undating the inventory and the (more tedious) updating of the index. I have also provided some historical details of the Inner London parishes that are referred to in the Inner London inventory sections 1-3. To open this, please click the button below. If you experience a problem using the button, there is an alternative link at the bottom of the column. As a guide I have produced a pair of maps, showing all Inner London Parishes and their detached parts; this might be helpful in understanding the boundary lines I describe. There are two maps, one north of Thames and the other south (the latter is provisional and subject to minor amendment). There are also things that are often confused with being parish boundary marks but are not. I have put a few examples on a separate page. Click on the following button to view. Opens in new window. Local authorities and property owners are under no obligation to maintain or preserve parish boundary markers unless they happen to be attached to listed buildings or (very unusually) are listed themselves. Unsurprisingly, this contributes to the fact that each year the already small proportion of survivors diminishes further, with venerable and occasionally unique types disappearing forever. Several have gone while I have been seeking to record them. I am attempting to record their passing here as they come to my notice. Since I have no photographs myself I can do little more than point to where I know photos exist. Alternative links (in case you cannot use the buttons provided above). 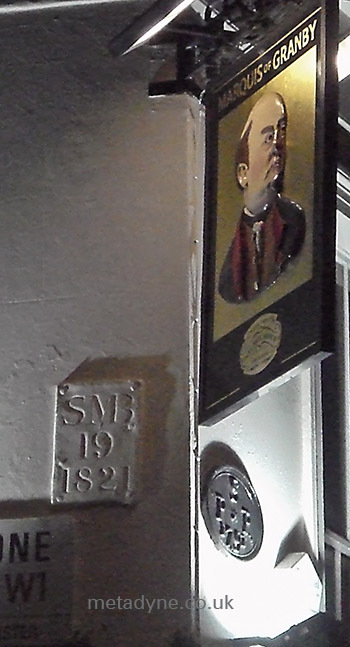 A pair of very old parish boundary marks on side of pub are made particularly visible by the floodlighting. 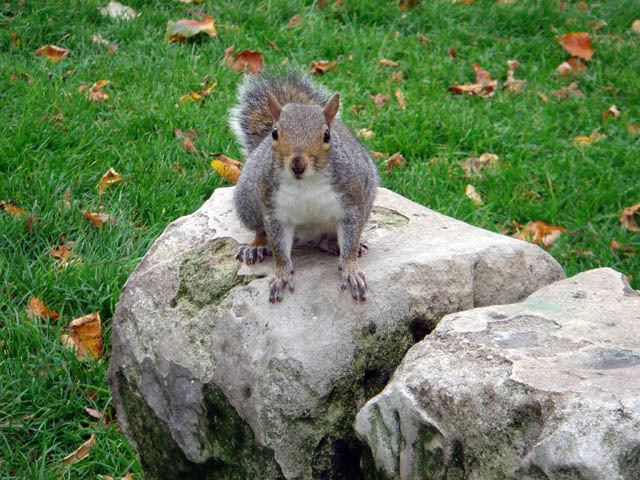 Above is one of the residents of Kensington Gardens guarding a 180 year old boundary marker. Behind the railings can be seen two markers setting out boundary between St George Bloomsbury and St Pancras. In the foreground may be seen the abrupt change in style of paving at exactly the same spot. The kerbing is certainly Victorian and shows the differing styles adopted by each parish; the paving itself could equally be of similar age. This type of feature change at an ancient boundary is now rather unusual but it shows the significance of these old boundaries. Boundary Marker update information is located here. If your browser does not support frames you can find the update information at http://www.metadyne.co.uk/PBM_updates.html. If you believe that a mark I have recorded has disappeared or is under threat, I would be pleased to hear from you. The Pinner Local History Society has identified several marks in Pinner (LB Harrow) that I have not been able to find and proposed they be locally listed (boundary marks in Harrow are sparce). They have produced some useful background information that appeared in the Council's documentation and it is usefully put here.